Despite the growth of using brown spirits in mixed drinks, Cognac has not benefited to the same degree. The same can be said of liqueurs, with Grand Marnier and Domaine du Canton the only two Cognac-based examples that spring to mind. A few years ago, renowned crème de cassis producer Merlet, located in the Fins Bois cru of the region, introduced two Cognac-based fruit liqueurs – one with cassis (blackcurrant) and one with citron (lemon), both bottled at 33% abv. The range was named C² – why you may ask? It’s simple: each variety is a combination of Cognac and a fruit starting with ‘c’. Merlet was established by Firmin Merlet in 1850 in the Charente-Maritime department of France. 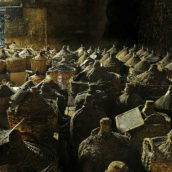 From humble beginnings as a Cognac producer, the business grew – culminating in supplying major houses such as Hennessy. After more than a century of Cognac production, the end of Les Trente Glourieuses (a period of boom in the French economy) caused the company to adapt. 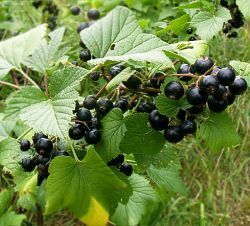 Gilles Merlet made the decision to replace some grapevines with Noir de Bourgogne blackcurrant bushes – a Burgundian variety renowned for its high-quality fruit, in order to produce crème de cassis. Such was the international success of this blackcurrant liqueur, (including the Liqueur Trophy in the recent International Wine & Spirit Challenge 2014), that the company has applied to French agricultural regulator INAO to obtain ‘protected geographical indication’ for cassis de Saintonge (blackcurrants grown within the local area), a similar designation awarded to many food and drink products – Welsh lamb being one example. We stock the blackcurrant and lemon variants – currently both are on offer at nearly half price. Merlet C² Cognac & Lemon Liqueur. 33%. £14.95 (was £29.15). A blend of VSOP Cognac with macerated lemon and lime peels, this was awarded 94/100 by the prestigious Beverage Tasting Institute competition. Nose: Lemon-heavy with ginger and anise in the background, along with a hint of oak. Palate: Big and rich, with a creamy texture, lemon and lime zest, along with underlying notes of vanilla and oak. Finish: Long – the lemon and vanilla flavours combine to leave a lemon-curd-like aftertaste, with subtle oak in the background. Comment: A rich style of lemon-flavoured liqueur – it’s the Cognac that makes the difference here, imparting some spicy oak notes. Bigger and bolder than many limoncellos, it’s a delicious alternative, even more so at this price. Merlet C² Cognac & Cassis Liqueur. 33%. £14.95 (was £29.35). A combination of VSOP Cognac with macerated blackcurrants (the local cassis de saintonge), rated 98/100 by the Beverage Tasting Institute. Nose: Rich cassis (more crème than Ribena), with hints of cherry and spicy oak. Palate: Rich, but not overly syrupy, with concentrated blackcurrant jam and vanilla at the front and black pepper and a hint of tobacco appearing at the end. Finish: Long and rich, with the blackcurrant flavours slowly dissipating to leave a lingering note of sweet vanilla. Comment: All the hallmarks of high-quality crème de cassis, but with everything turned up to 11. Both the liqueurs are tasty enough on their own, especially paired with dessert or as a digestif – but if you can’t wait until the end of a meal, they would work well in pre-dinner cocktails: add 15ml of the citron to a glass of sparkling wine in a limoncello cocktail, or treat yourself by taking advantage of our Champagne offers and make a punchier version of a kir royale, the French classic.